Schloss Meseberg is a Baroque-style palace that serves as the official guest house of the German federal government. 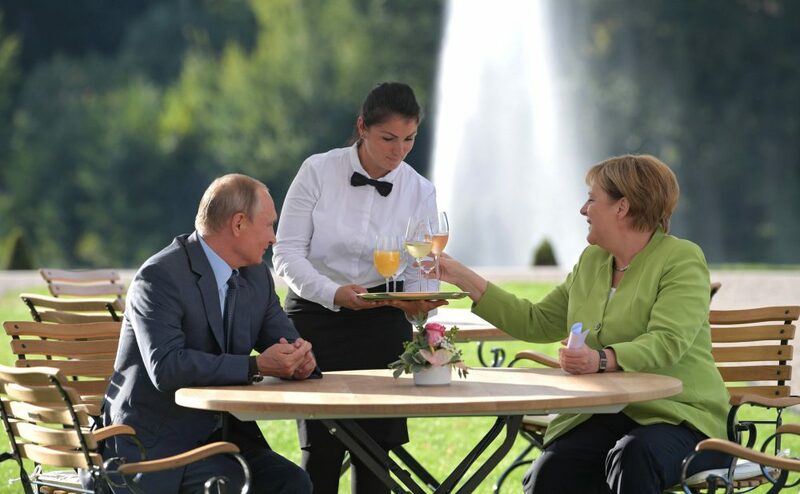 It sits in an idyllic location 70 kilometres north of the capital, and on Saturday Chancellor Angela Merkel hosted Russian President Vladimir Putin on a working visit there. It was their second get-together in three months, signalling a wish by both leaders to find solutions to international issues in the face of the uncertainty US President Donald Trump has brought to global politics. Expectations were strong that Merkel would raise her concerns about the situation in Idlib, where thousands of internally displaced Syrians are threatened by the likely upcoming battle for the city between Russian-supported Syrian government troops and the remaining rebels in the enclave. Over three hours, they discussed  that topic, plus Iran, the conflict in Ukraine, and Nord Stream 2, the controversial gas pipeline project. The leaders made short statements prior to the talks, but neither gave a press statement afterwards. Merkel and Putin have shared the international stage for over a decade and they have regularly discussed global issues in depth. But what was initially a positive relationship has become increasingly troubled since Russia’s illegal annexation of Crimea in 2014, the conflict in Eastern Ukraine and the Kremlin’s questionable involvement in Syria. Germany played a key role in levelling sanctions against the Kremlin and supported NATO measures to deter Russian military threats along its eastern border. For example, Germany serves as the framework nation for NATO’s enhanced forward presence in Lithuania. But even in the increasingly tense times since 2014, Germany’s chancellor has retained a better connection with Putin than any other leader in Europe, or in the White House. Over and over, Merkel has attempted to find diplomatic solutions to conflicts by involving all sides in negotiations. Merkel said  that Germany and Russia (as a permanent member of the UN Security Council) shared a responsibility to find solutions to international conflicts. She stressed that many such issues couldn’t be solved without Moscow’s involvement. Merkel underlined  the need for Russia to be engaged in avoiding a humanitarian catastrophe in Idlib and in working on a post-conflict order in Syria, which must include constitutional reform and elections. While Germany and other European nations share with Russia a determination to end the war in Syria, their views on how that should be done vary significantly. Moscow continues to support Bashar al-Assad and wants to retain its strategic foothold in the region, but it also wants to end its involvement in the conflict to save the millions of roubles that it consumes. Europe favours lasting peace, but without Assad, and seeks a return to safety and stability to allow refugees to go back. In his short statement, Putin touched on  his expectation that European governments would step up their efforts to rebuild essential infrastructure in Syria to facilitate the return of refugees from the region. Much of that infrastructure was destroyed by the Russian air force. Both sides can use the Syrian conflict as a pressure tool. Putin knows he can use his influence over the Assad regime, especially when it comes to Idlib, while the EU knows that the Kremlin longs for better relations with the West. Showing willingness to find a solution that meets Europe’s goals in the post-war order in Syria could bring Russia a step closer to achieving that. However, Europe expects much more from Russia than a change of approach to the war in Syria and what should follow it. The conflict in Eastern Ukraine was also an important item on Saturday’s agenda. Merkel is said to have again raised the possibility of an international peacebuilding mission being deployed to Ukraine’s conflict region, something she discussed with Putin during their meeting in Sochi in May. A related issue is the Nord Stream 2 pipeline project which Moscow intends to have online by the end of 2019 to carry Russian gas to Germany, and from there to other parts of Europe. That will circumvent the need to transit the gas through Ukraine, which means Kiev will lose out on about US$3 billion a year in fees. Merkel changed  her approach to the pipeline project recently—acknowledging its political character but continuing to support it—while Putin again ignored Merkel’s call for Ukraine to be involved in it. The Russian leader insisted that  the project was ‘only economic’. Putin knows, however, that Nord Stream 2 will play a significant role in improving relations with the rest of Europe. And improving German–Russian relations will be key to warming up general EU–Russia relations. Both will improve only if the Russian government shows willingness to de-escalate in both Syria and Ukraine. Whether Saturday’s meeting stirred discussions on that possibility remains to be seen. Jacqueline Westermann is a researcher at ASPI. Image courtesy of the President of Russia.